The contour is like a swimming pool with a deep and shallow end. 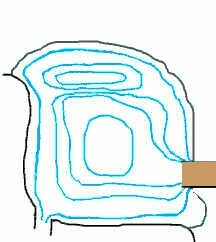 The liner base on the deep end has 2'x2' patio stones on the slope with regular 8"x16" patio stones forming a shelf with a ridge as shown. This helps keep the stones on the top edge and the patio stones protect the liner from roots and rocks. The shallow end just has the liner edge buried under rock, pea gravel and sand. The substrate is as mentioned old shag carpeting and pad sandwiched between 8 mil plastic sheeting. The big rocks on the ledge have an extra piece of EPDM rubber under them to reduce the wear on the liner. This contour map shows the "channel" where the dock/pump is.